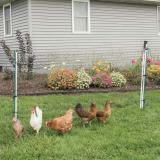 Quickly installs at the ends of existing garden or poultry fences. Gate post locks into place via a handle and docking station. Stainless steel clips at each end of the gate provide electrical connections to the fence. Features drivable posts which are useful in dry, hard or rocky soils. 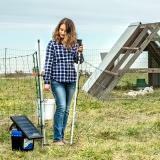 Keeps in or stops: poultry, ground hogs, rabbits, raccoons, foxes, opossums, bears, dogs and skunks. 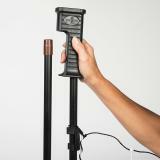 Drivable posts can be inserted into hard soils using a mallet or dead blow hammer. 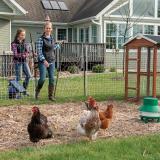 Poultry runs or gardens where small predators and pests are a major concern. Can be used with shorter (height) nets. Includes gate, posts, handle & docking station. 4 ft, 8 ft and 20 ft length options. 12 horizontal strands (11 conductive). Horizontals are white and black (visible for humans and animals against all backgrounds) or green and black (for those who prefer to have the fence blend into the background or landscape). Horizontal spacings from bottom to top are: 2", 2", 2", 2", 4", 4", 4", 6", 6", 8", 8". 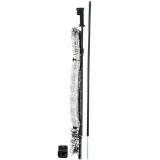 Verticals are white plastic strings placed every 3". 20 ft gate contains a center post. 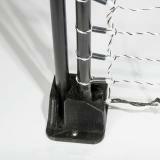 PoultryNet Gates are not effective with baby chicks that are small enough to crawl through the net openings and therefore are not deterred by the electric shock. Recommended: 20 out of 22 said they would recommend this product to a friend. Just installed this gate for our chicken area and love it! So much easier than trying to climb over the netting. 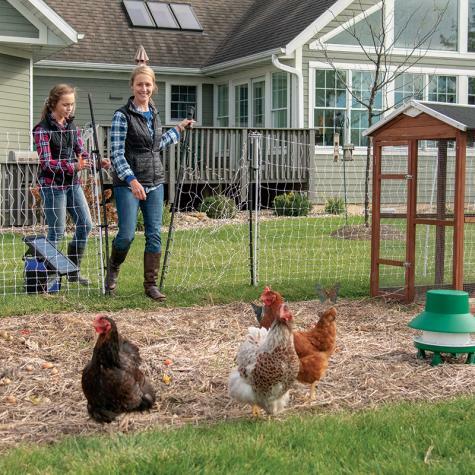 Installing it was a breeze and it will make chicken chores so much easier! I have one gate on each run of 100 foot fence which makes it very easy to get in and out without problems! My son has balance issues due to his CP. Most of the time he could handle walking over the fence without any issues. Then there would be times that he would stumble and fall. This gate has been wonderful! Solved his problem. It opens with one hand! No longer have slacked fence from always stepping on fence. So glad we have it. Great piece of gear. It’s an absolute must have with poultry netting. The caps do fall off but it an easy fix. 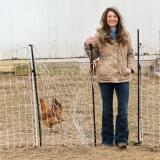 If you are looking for an easier way to get in, and out, of your fenced area then this is it. It matched up perfectly with my 48" tall poultry netting, and I am not seeing any voltage drop having my charge go through the gate connections. I am so happy to not have to be tying and untying the opening over and over again. This might not be a "required" item for securing your poultry/livestock but it sure is a very nice addition to the system.